Why Do We Pay Taxes? When you get your paycheck, you may notice some money is withheld from your income for taxes. Every April 15, you need to file your taxes and sometimes pay additional taxes. When you buy anything in the store, you may see taxes listed on your receipt. Let’s face it: taxes are everywhere. If you don’t pay your income taxes, you can face penalties, fines and even jail time. Taxes pay for a variety of things, from school teachers to government workers. Look around you at many of the things that are “free:” The roads you travel on, the bridges you see in the distance, the public library where you can get books for free, the firefighters who arrive at your door at no cost to save your life. There are the public fairs and special events as well as the green spaces you enjoy without paying. If you went to public school, you didn’t pay tuition. These things are not “free” at all — they’re paid for by your taxes. Your taxes also pay for the government. The state, federal and local governments that run the country or your corner of the country rely on your taxes to run departments, pay employees and implement programs. Everyone from the President to your local representative relies in part on your taxes. In addition to local taxes, which you may pay for through property tax, you pay state and federal taxes. You may pay state taxes through income and sales taxes. You generally pay federal taxes through your income tax. While people debate about the programs paid for by taxes, and the cost of those taxes, there are entitlements and benefits that come from the taxes we pay. You pay taxes whether you realize it or not. Long before you have a job, you pay taxes in the form of sales tax. Once you have a job, you’ll have to file taxes and have them withheld from your paycheck. This ensures you pay your income taxes gradually over time instead of in one big chunk in April. You’ll want to ensure the right amount is withheld from your income every month. If too little is held back, you could face a big bill in April. If you’re paying too much, you’ll get a refund in April — but until then, have less money in your wallet. Having more money to take home every month can help you save up and invest it instead of letting the government hold onto it only to return it to you later. 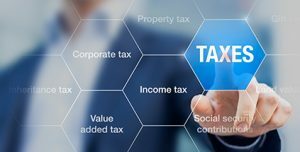 To make sure you understand how to calculate tax on total income decide how much your withholdings should be, Money Help Center has a tax withholding calculator to help you figure out your take-home pay and your tax obligations. Will I Pay Capital Gains Tax on the Sale of My Home? Traditional or Roth IRA – Which is Better for You?